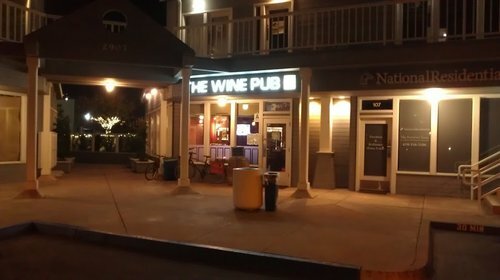 Point Loma’s Wine Pub bucks the trend of giving wine bars cutesie names. The space, however, is quite precious with its modern accents and vaguely nautical trim that seems appropriate to the neighborhood. They have a few full-sized entrees ($12-$15), panini ($11-$13), and some soups/salads/small plates in the $5-$12 range. Sunday 4-6pm: $5 craft beers on draft, $5 select red and white wines, $5 toasted Levain with caramelized onions, blue cheese, and sausage, Cheese of the Day, arugula salad, three-cheese crostini. Monday 4-6pm: $5 craft beers on draft, $5 select red and white wines, $5 toasted Levain with caramelized onions, blue cheese, and sausage, Cheese of the Day, arugula salad, three-cheese crostini. Tuesday 4-6pm: $5 craft beers on draft, $5 select red and white wines, $5 toasted Levain with caramelized onions, blue cheese, and sausage, Cheese of the Day, arugula salad, three-cheese crostini. Wednesday 4-6pm: $5 craft beers on draft, $5 select red and white wines, $5 toasted Levain with caramelized onions, blue cheese, and sausage, Cheese of the Day, arugula salad, three-cheese crostini. Thursday 4-6pm: $5 craft beers on draft, $5 select red and white wines, $5 toasted Levain with caramelized onions, blue cheese, and sausage, Cheese of the Day, arugula salad, three-cheese crostini. Friday 4-6pm: $5 craft beers on draft, $5 select red and white wines, $5 toasted Levain with caramelized onions, blue cheese, and sausage, Cheese of the Day, arugula salad, three-cheese crostini. Saturday 4-6pm: $5 craft beers on draft, $5 select red and white wines, $5 toasted Levain with caramelized onions, blue cheese, and sausage, Cheese of the Day, arugula salad, three-cheese crostini. Monday 4 p.m. to 9 p.m.
Tuesday 4 p.m. to 9 p.m.
Thursday 4 p.m. to 9 p.m.
Friday 4 p.m. to 11 p.m.
Saturday 4 p.m. to 11 p.m.